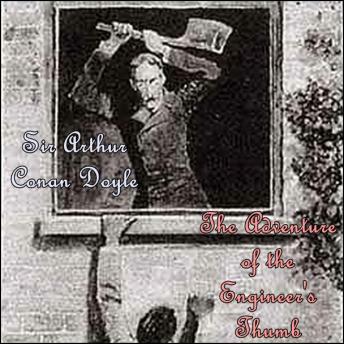 "The Adventure of the Engineer's Thumb", one of the 56 short Sherlock Holmes stories written by British author Sir Arthur Conan Doyle, is the ninth of the twelve stories collected in The Adventures of Sherlock Holmes. The story was first published in Strand Magazine in March 1892. An engineer, Victor Hatherley, attends Dr Watson's surgery after his thumb is chopped off, and recounts his tale to Watson and Holmes. Hatherley had been hired for 50guineas to repair a machine he was told compressed Fuller's earth into bricks. Hatherley was told to keep the job confidential, and was transported to the job in a carriage with frosted glass, to keep the location secret. He was shown the press, but on closer inspection discovered a "crust of metallic deposit" on the press, and he suspected it was not being used for compressing earth. He confronted his employer, who attacked him, and during his escape his thumb is chopped off. Holmes deduces that the press is being used to produce counterfeit coins, and works out its location. However when they arrive, the house is on fire, and the criminals have escaped.